Our 2018 guide to holiday gifting is all about spreading goodwill and cheer by being intentional about shopping with local businesses. To save you legwork, we've wrapped up everything you need to know and tied it with a bow in this gift guide. And you'll learn about Giving Tuesday, how local businesses kick off the season with giving, and how you can too. Happy giving, happy gifting and happy holidays. Aegle Gear – These aren't your typical scrubs. Fluid repellant, stylish fit, antimicrobial, stretch waistbands, articulated knees – Aegle's athletic- inspired products are a far cry from the pajama-like attire many health care workers find themselves wearing. They come in a range of colors and pieces for layering. You might become your favorite nurse's favorite gift giver thanks to Aegle. » Order at aeglegear.com; pieces starting at $35. Bees on a Bicycle – Southside urban garden center Bees on a Bicycle stocks plants and botanically themed gift items as well as some home décor, in addition to hosting events and classes such as wreath-making how-tos on Nov. 30. Their Christmas specialty items include custom hand-blown ornaments, among other unique holiday decorative items. Their variety of one-of-a-kind pots and planters are a particularly fabulous gift idea to dress up any patio or porch for the holidays and beyond. » Pottery pieces and gifts are $6 and up. 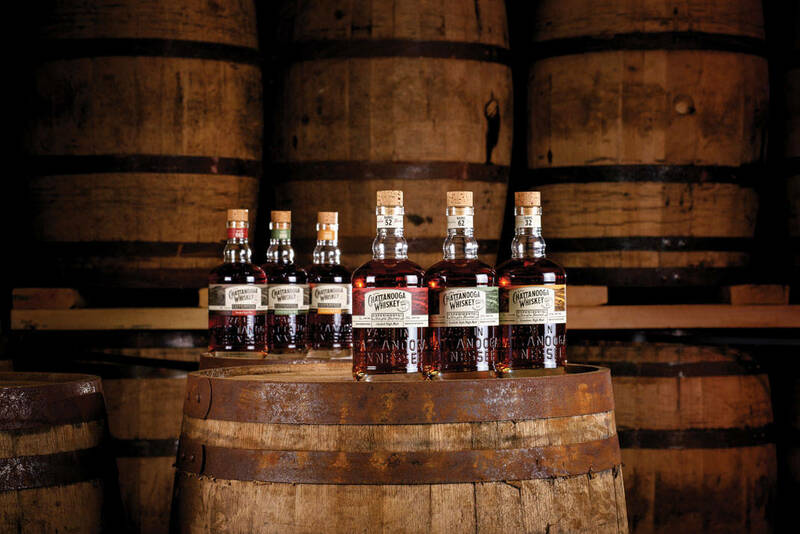 Chattanooga Whiskey – Choose from three expressions in the 1816 Series: Reserve, Cask or Native, or for that special someone, explore our limited edition Single Barrel Series for a one-of-kind gift. » Available for purchase at the Chattanooga Whiskey Experimental Distillery at 1439 Market St. and at local liquor retailers. Hart Gallery Tennessee – This Main Street art gallery offers homeless and nontraditional artists a venue to create and sell their work. You can learn about the artists and find a variety of their fine art pieces, jewelry and other items both at the gallery and at hartgallerytn.com. » Items priced from $5. See Rock City – You may not give them a second glance if you live here, but nothing says iconic Chattanooga like a See Rock City birdhouse. This is a popular gift item for out-of-towners, as these birdhouses have made their way to homes across the globe. So don't be shy about bringing the iconic barn to a backyard near (or not near) you for those on your list who enjoy birdwatching or historical decor. » Order at seerockcity.biz. Choose birdhouse or birdfeeder, both $19.99. Sierra Madre Research — Give the gift of sleeping comfortably outdoors. Some reviewers say that Sierra Madre's hammocks are so comfortable they've set them up at home to sleep in every night. Sierra Madre's selection of camping hammocks keep you dry, warm and covered, offering unique add-on features like an enclosure that keeps you dry and includes a storage compartment to keep gear and backpacks off the ground. And for every product you purchase, a portion of the proceeds go toward efforts to provide clean drinking water for people around the world. » Order at sierramadreresearch.com; hammocks starting at $79. Hoff & Pepper — High quality, fresh ingredients and sweet simplicity differentiate Hoff Sauce. These hot sauces are designed to kick up the flavor of any dish and come in several varieties from Smoken Ghost to Mean Green. Ingredients are locally sourced, including chilis from a family farm in Dayton, Tennessee. There's even a TSA-approved mini flask for the traveling foodie, and it's the perfect transition to our stocking stuffer suggestions. » Order at hoffandpepper.com and purchase at many local retailers. Mini flask $6; full-size sauces $10. B's Sweets — Special order cakes, cookies, cupcakes and more from B's are excellent, and their shop on Signal Mountain Road also offers a case of treats for individual purchase – cute cookies in my stocking? Yes, please. » Priced at $2.50 for individual cookies and cupcakes, and up. » Dipped Fresh — While they're known around town for their excellent catering, Dipped Fresh also offers gorgeous candy apples that would be a sweet addition to any stocking. Also choose from Oreos, caramels, cherries or bacon – all covered in chocolate. » Order and find more info at DippedFresh.com. $12 and up. The Hot Chocolatier – At their Market Street store, you can always find an array of pretty chocolate treats already nicely packaged. In addition, their case is stocked with truffles, and you can even select from the case for a customized box of chocolates – the perfect stocking stuffer. Sipping chocolate or hot chocolate mix are great options too. New products this season include dark chocolate bourbon caramels, milk chocolate toffee pistachios, milk chocolate toffee coconut macadamias and vegan dark chocolate almonds. » Priced $4 and up. The Rustic House candles — While their regular size glass candles make great presents for any occasion, Rustic House also offers all of their scents in a miniature (i.e. stocking-sized) candle, as well as six-piece wax melts. » Order at shoprustichouse.com and purchase at many local retailers. Mini candles $14.99; wax melts $6.99. The Spice & Tea Exchange — Located on Gunbarrel Road, the Spice & Tea Exchange offers custom spice and tea blends for the chefs and hot beverage lovers you know, many perfectly packaged to slip into a stocking. The shop is also worth browsing for full-size gifts. » Spice & Tea Exchange offers a buy five get one free deal in-store. » AbbyLane Boutique (300 Cherokee Blvd., Chattanooga) — This unique boutique offers a selection of stylish clothes, jewelry, handbags and more. Plus their blog gives excellent styling tips for women of all ages. Antibes (813 Chestnut St., Chattanooga) — Located in the revamped West Village of downtown Chattanooga, this fun shopping spot named after a French resort town boasts an eclectic array of items from clothing for men and women to cute gift items and more. » The Galleries on Williams Street (1403 Williams St., Chattanooga) — This stop truly has something for everyone. Furniture, home décor, candles, jewelry, whimsical clocks, sassy dish towels with sayings like "If my memory were any worse, I could plan my own surprise party." And I know someone came to mind when you read that. » The Rug Rack & Home Decor (301 West 25th St., Chattanooga) — The Rug Rack & Home Décor opened in 2000 and has expanded from beautiful rugs to a boutique showroom, now offering mattresses as well as home décor. While an area rug or mattress might not be something you're comfortable gifting, Rug Rack is worth a stop for unique décor items for any homeowner or the decorating maven in your life.